It’s full on fall and what a lovely season it is. We spent last weekend browsing the stalls at our local farmer’s market, stealing samples and purchasing way too many baked goods. I love farmer’s markets. They make me feel healthy, even if the only purchases I make are cinnamon buns and homemade donuts. However, this time we splurged on apples and squash. I’ve never bought squash before. It felt wrong. My mother has always given me ample boxes every fall, but this year, they failed to grow in her garden, and I found myself picking through a scant box of sad little squashes, dreaming of squash soup and muffins and purée. I love squash. It’s good stuff and, despite the squash shortage this year, I was determined that my autumn palate would not go unsatisfied. Boo was eager to help choose the squash. She cradled each on in her arms before declaring, “This is the cutest little squash ever. Can we get him?” I more than happily obliged, even though the little guy was more than a bit bruised. She selected two more “friends” for him and then we went home. That evening, having flipped through my recipe book to my tried-and-true squash soup recipe, I rummaged through my farmer’s market sack to retrieve the coveted veggies. They were gone. Or at least I thought they were until Boo and little E happily pushed their doll strollers through the kitchen, each carrying a swaddled squash. 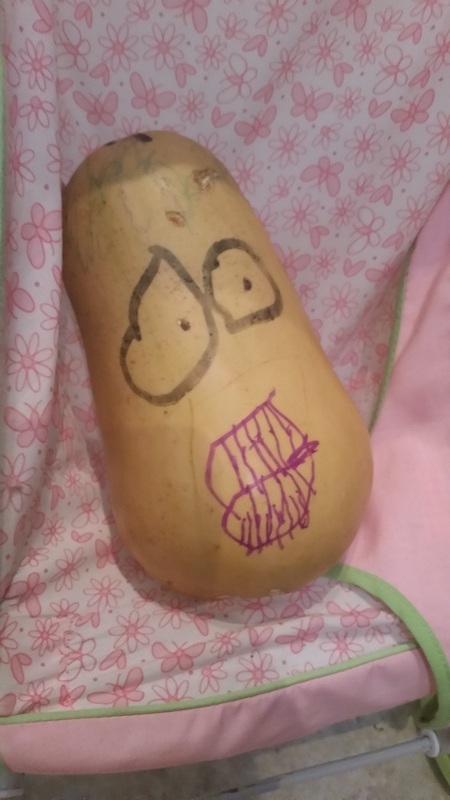 The squash stared at me with large eyes that Boo had colored on. They looked scared and surprised. Boo and E looked proud and delighted. “These are my squash babies. I love them so much,” Boo declared before she pushed her stroller out of the kitchen, with E following close behind. We didn’t have squash soup for supper. We still haven’t had squash anything for supper. This would be the wonderful premise of a children’s book, but for those of you who know your kids’ literature, this is the exact tale of Sophie’s Squash, a wonderful book about a little girl who becomes best friends with a squash. Boo loves the book and is enjoying recreating it in her own life. It’s innocent fun and I don’t mind playing along, for now. I know I will get my squash at some point, and I will cook it according to a recipe, careful to follow all the directions, for fear that too much creativity or freedom will ruin something good. But Boo, like all children, will stray from the norm and conventions. She will experiment and push limits and create and destroy. She will have fun. And for now, since I have lost this ability to create entertainment from everything, and yet nothing at all, I will try to relax and enjoy some of her much needed childish fun.